Khalida Brohi is the founder and executive director of the Sughar Empowerment Society, a nonprofit social enterprise in Pakistan dedicated to providing tribal and rural women opportunities to grow their skills as well as learn leadership skills in an environment of growth and development. Brohi launched Sughar in 2009 ("Sughar" means "skilled and confident woman") to provide opportunities to unleash the potential of all women in Pakistan, such as resources to launch and sustain rural businesses. Brohi's aim over the next 10 years is to change the lives of one million women in Pakistan. 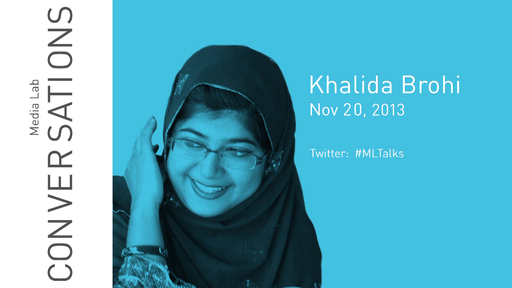 Khalida Brohi has been named one of Newsweek magazine's "25 under 25" and "100 Women Who Matter in Pakistan," and has been awarded the "Woman of Impact Award" by the Women in the World Foundation; the Women Excellence Award by national Government of Pakistan; the Young Champion Award from the University of Singapore; and the Unreasonable Institute Fellowship Award. Brohi has addressed numerous global forums, and has received recognition from Oprah Winfrey, CNN correspondent Christiane Amanpour, and former American President Bill Clinton.